In the latest update from OnePlus One there is some news about the latest update regarding the Lollipop based CyanogenMod OS 12S which users have been waiting for since a long time. 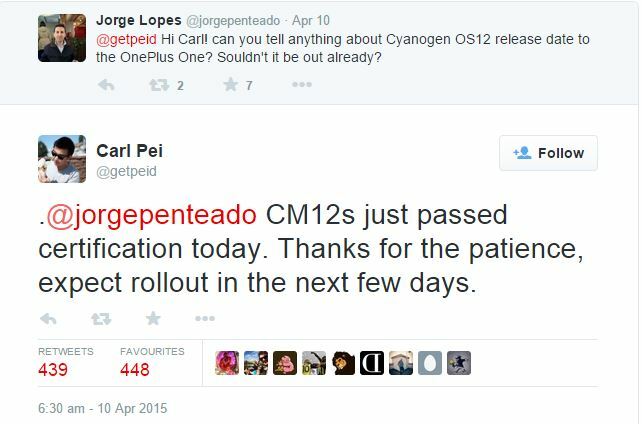 The update is being considered as official because it was given by none other than Carl Pei who while responding to a query from a user who asked about the release date of cyanogen OS12 for OnePlus One. And Carl Pei who uses Twitter with the twitter handle @getpeid in twitter has said “CM12s just passed certification today. thanks for the patience, expect rollout in the next few days”. This makes it official that OnePlus One users can now expect the latest OS update of CyanogenMod 12S in the next few days which is uncertain as to when it can exactly be released. According to OnePlus the CM12S will be rolled out bia OTA update for Indian OnePlus One users, this comes after the recent release of the OnePlus One company’s own Oxygen OS. This Lollipop based CM12S update was supposed to be launched on March 30th but the deadline was missed and many users were not happy about it. To make the users happy OnePlus one even gave away five OnePlus One’s to compensate missing the release date. The missing of the deadline can be said may be due to the fact that YU has got the rights of Cyanogen and it is not being available for OnePlus One devices. This lead to the news that Indian users will not be getting any further Cyanogen updates and instead will be receiving only OxygenOS exclusively made by OnePlus. And there was a recent update for the Indian OnePlus One users that the CM12S will be available for everyone right after the release of the OS. There were many replies and queries to the tweet by Carl pei asking him to improve the Battery life and many other requests by users.